Gung Hay Fat Choy! Happy Chinese New Year! 2013 is the year of the Snake, which just so happens to be my zodiac sign. Apparently we snakes are intelligent, graceful, analytical, and enjoy quiet. Sounds like me to a T! Regular readers will know that I also enjoy Chinese food and have in the past indulged in yummy New Year feasts at my favorite Chinese restaurant, Grace Garden. This year, we stayed home, but I put together a couple of dishes that are traditionally served for the New Year. 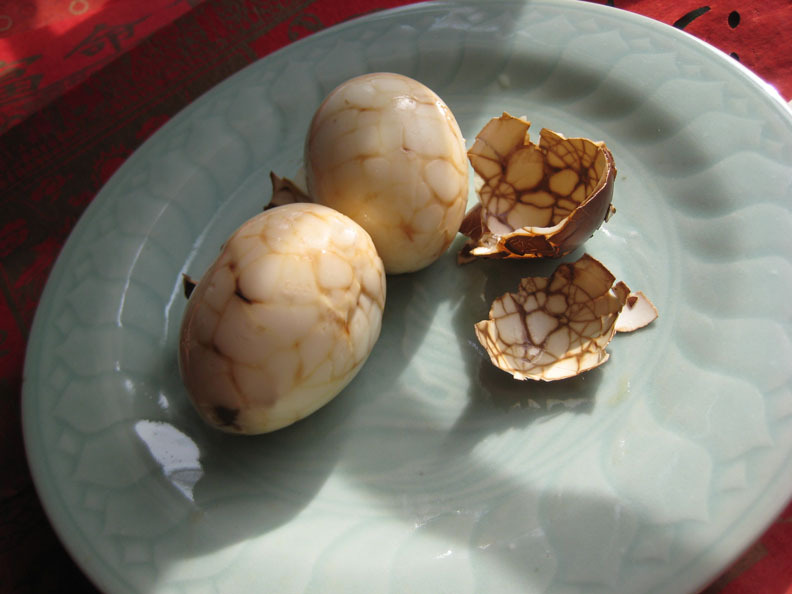 The first of them is marbled tea eggs. They symbolize gold nuggets, aka wealth, which is always a good thing to hope for in the coming year. Chinese marbled tea eggs are really easy to make and very tasty. 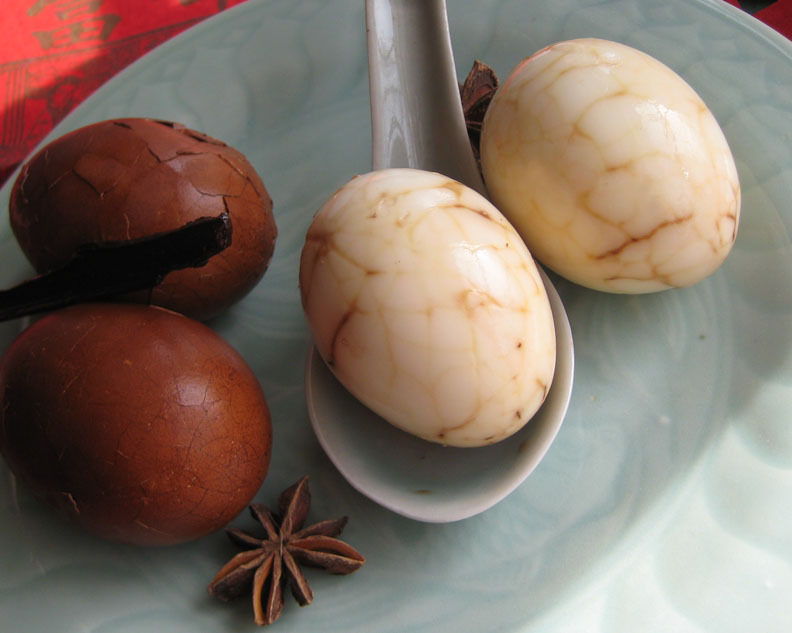 Just par-boil some eggs, crack the shells, and soak them in a flavorful liquid that includes black tea, soy sauce, and star anise. We ate them in a rather non-traditional way - for breakfast, with hot buttered toast. But you can eat them as a snack any time of the day. Place the eggs in a medium saucepan and fill with water to cover by 1 inch. Bring to a boil, then immediately lower the heat and simmer for 3 minutes. Turn off the heat, remove the eggs from the water and place in a bowl of ice water to cool down. Add the soy, star anise, tea bags, cinnamon stick, sugar, peppercorns, and orange peel to the hot water still in the sauce pan. Remove the eggs from the ice bath and, one at a time, crack the shells all over with the back of a teaspoon to produce a spider-web effect. Don't break off chunks of shell! Add the cracked eggs to the soy mixture in the pot and turn the heat on. Cover pot, bring to a boil, then turn heat to low and simmer eggs for about half an hour. Turn off heat and allow eggs to steep in the liquid. 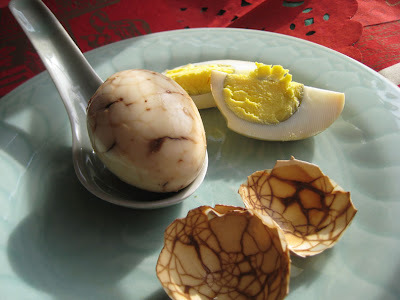 After the pot has cooled down, refrigerate the eggs in the liquid to allow more flavor and color to seep into the eggs.